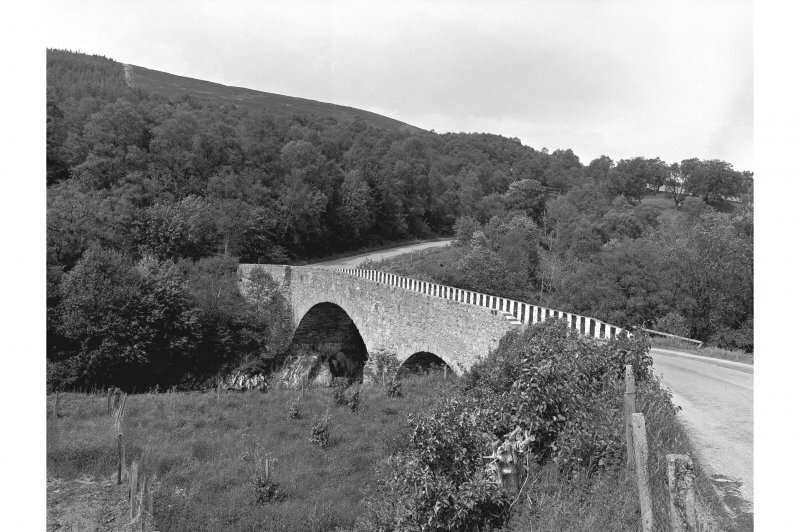 Bridge of Avon, situated at the head of Strath Avon, once carried the Coupar Angus to Fort George military road over the River Avon. The bridge was built in 1754 by the 33rd Regiment and still carries the main road over the Avon. The Avon Bridge is rubble-built with two arches, one of which is larger than the other. In 1831, the smaller arch was replaced, having been partially destroyed in a massive flood in 1829 that swept away several bridges in the area. The original parapet has been removed to accommodate an iron girder bridge. Military type bridge of a main and smaller arch. The smaller arch was destroyed in the floods of 1829 and reconstructed in 1831. Visited by OS (RB) January 1966. (Location cited as NJ 149 201). Bridge of Avon, 18th century. A two-span rubble bridge with segmental arches of unequal size. This bridge carries the A939 public road [Military Road MR 9] across the River Avon, at the head of Strath Avon. Information from RCAHMS (RJCM), 18 October 2000. OS (GIS) MasterMap, September 2010. The Bridge of Avon, over the Avon, together with nearby Grantown (NJ 0395 2630) and Dulsie (NH 9321 4140) bridges are representative of the genre of Caulfeild military bridges built in ca.1754. They are all asymmetric, of rubble masonry and span dimensions dictated by the need to found abutments on rock outcrops. The Bridge of Avon has spans of 49 ft and 23 ft and is well maintained and easily accessible. It has been bypassed by a modern bridge carrying the A939 road. Dulsie Bridge over the Findhorn, one of Scotland’s most picturesque bridges, has a main river span of 46 ft and a flood-relief arch at the northern end on a high rock outcrop. In 1829 the river level here rose 40 ft above normal level, causing minor damage to the bridge. Grantown and Dulsie Bridges, which now carry local access roads, have steeply inclined roadways. The 1930–31 Grantown Bridge [NJ 0335 2680] now carrying the A95 road over the Spey is half a mile northwest of the old military bridge with its three spans of 72 ft, 40 ft, 19 ft and 13 ft wide roadway, which now forms part of the Spey-side Way. The 1931 bridge, shown with its slender 240 ft span reinforced concrete three-pinned arch, then the second largest in the UK, was designed by Blyth & Blyth and built by Melville, Dundas and Whitson at a cost of £32,000. R Paxton and J Shipway, 2007. Reproduced from 'Civil Engineering heritage: Scotland - Highlands and Islands' with kind permission from Thomas Telford Publishers.